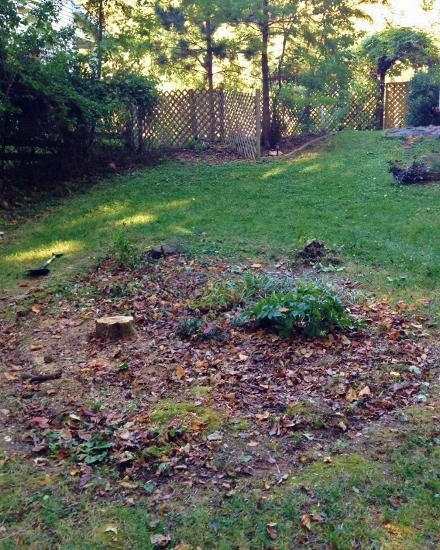 She wrote that she had cut down a tree and was tearing up an ornamental garden to prepare for a big vegetable garden next year. 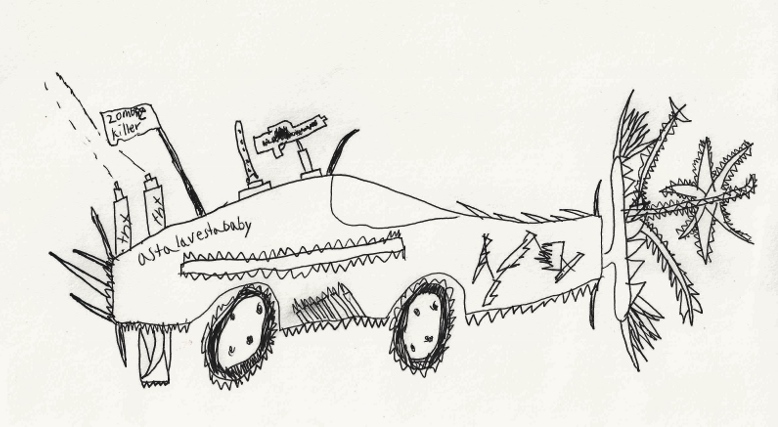 Me: A sigh of gladness that another vegetable garden will exist in the world that is not the expected quadrilateral. 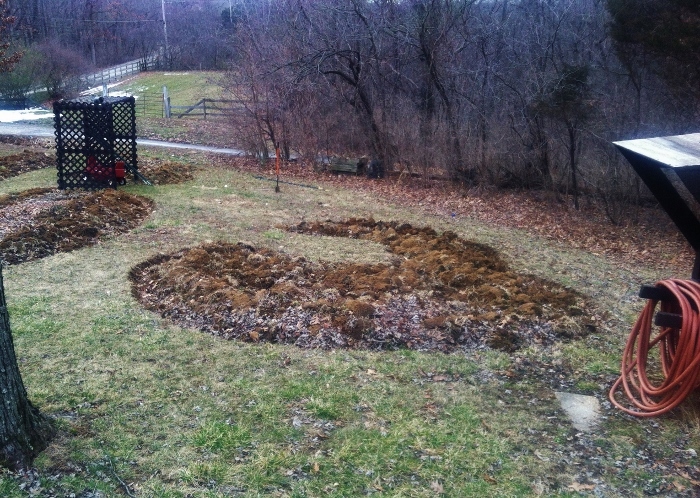 Since I consider myself to be the Robert Smithson of gardening, the shapes of my garden plots are very important. You can dig a 10′ x 10′ square but that is just so boring and expected. 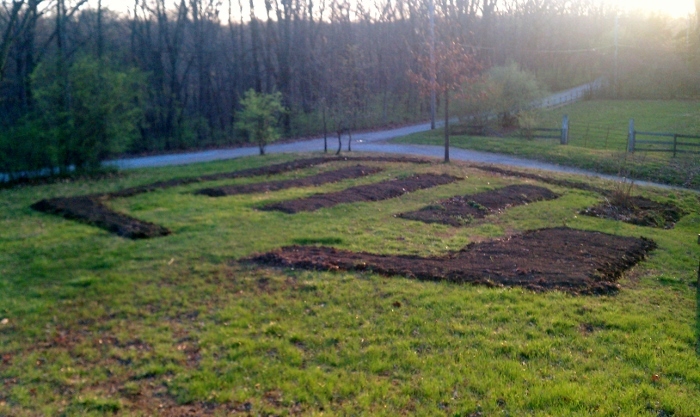 We started with squares and rectangles and pretty soon the garden started to look like the Transformers logo. And while I think the Transformer movies are pretty entertaining, I wanted the garden to exude a less futuristic vibe. So I started cutting curves into the earth. I do have the three rectangular strips in the middle, but this year I rounded off the ends of them. In that grassy area there in the middle. Aside from the aesthetic value of unexpected shapes in dirt, it is very pleasant to walk through your garden, without having to walk in the dirt. Hence the grass paths between the shapes. 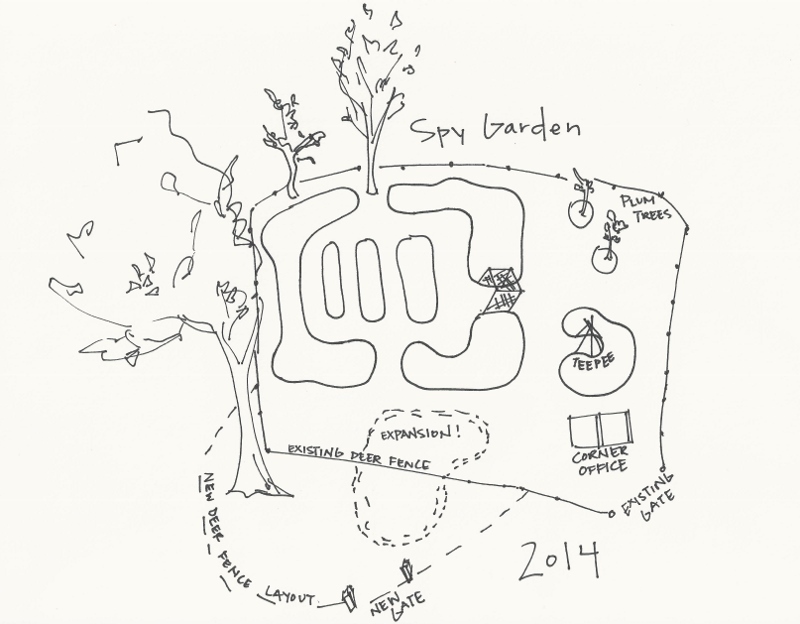 The paths make a garden infinitely more accessible to children (and really to everyone). My grass paths started out quite wide, but have quickly gotten narrower. So this year I will be careful in edging not to widen the plots any more. I will indulge my need to dig instead in a garden expansion! It would seem the garden is large enough. However, your garden can never be too big. I want more pumpkins next year and I want to try growing those BIG pumpkins. So I need one more pumpkin patch type spot. Plus the trees around Spy Garden are shading more and more areas, and while many plants I grow do great with a bit of shade, some need full sun. I could cut some of the trees down and trim the others. 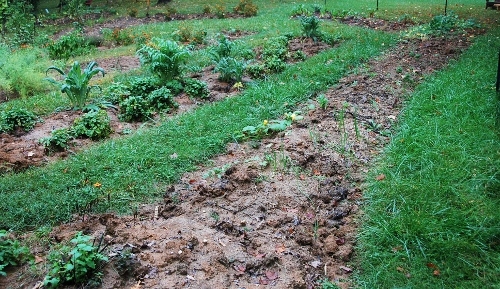 Or indulge my need to dig and just make a new chunk of garden. I love planning and expanding the garden in fall. The ground is soft. 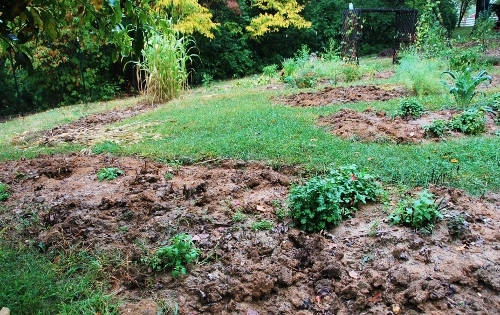 Fall rains and cooler temperatures really make digging a breeze. Fall and winter are the perfect times to dig. The ground is damp, but not too wet. Plus you can really work up a sweat and still stay cool and not accidentally get heat stroke if you whip yourself up into a digging frenzy. If you start now you have loads of time. You could dig a single shovel-full of soil PER DAY and probably still have a 300SF of garden (but please not in any boring dimensions) by spring. 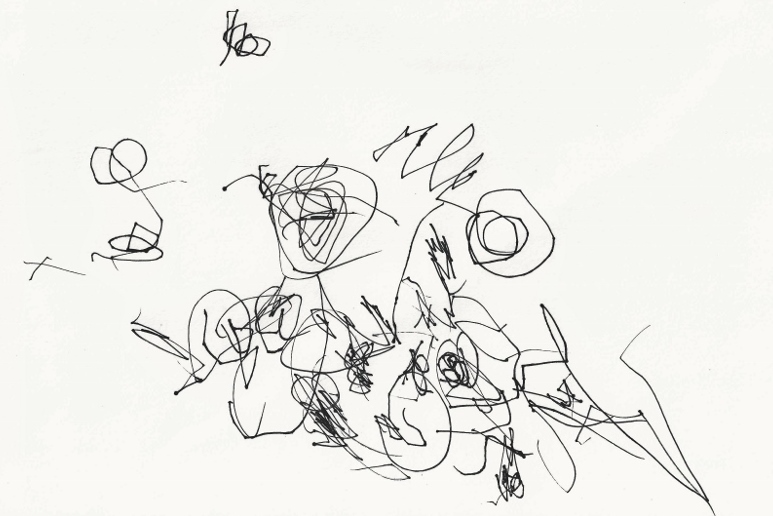 And if you flip over a shovel-full clod of dirt and it is all stuck together (i.e. if your dirt has a high clay content) you don’t even need to worry about breaking it down because the elements will do it for you over the new few months. This entry was posted in Art, Gardening, Humor, Kids, Missouri, Parenting, St. Louis and tagged Gardening with Kids Fall 2013, Gardens for Kids, Spring 2014 Garden Planning on October 17, 2013 by Spy Garden. Gardening is the bomb :). I love the way gardens evolve, right along with us. Yours are evolving beautifully! Besides being more pleasing to the eye, all my beds have rounded curves, largely because of lawn mowing; squares aren’t easy to cut! Also, all the tucked in spaces that are a pain to mow became gardens, like near the deck stairs. I could write a book just on how my gardens here morphed in (and out) of existence in the past 23 years! Maybe a subject for a future post?! Love the Spy’s Spanish…;-) He’s got a good grasp on phonics for an 8-year-old! I really enjoyed this you gave me some great ideas! I have no room for big square gardens, I never thought to just make smaller patches in any sort of shapes! Looks like a great plan. Will be fun to watch it grow! I feel overwhelmed by all my new garden space! Decisions, decisions. Yes turn the soil now. See how it looks in the spring and depending how “plantable” it looks then add some amount of compost/loam mix (or just bags of soil) right on top of what you’ve turned over. You know I usually have no clue what I’m doing in the garden either. It’s all trial and error! !